WCI's Virtual Dojo | Master Ninja Training Online! Now Accepting New Students - Limited Space Available! Are you trying to find Ninja training online? Are you tired of trying to learn from books and YouTube video clips? Are you trying to learn Ninjutsu but don't have a Ninja Dojo or instructor where you live? Do you want to have the power, confidence, and control of a true Warrior? Hi, I'm Shidoshi Jeffrey M. Miller and my Warrior Concepts Black Belt and Instructor Training Programs may be exactly what you're looking for! These programs are not for everyone. Let me ask you a few questions - and I want you to give them some serious, heartfelt, thought. Okay? What would it mean for you to get this training? How would it feel to have the skill, power, and ability to protect yourself and others? Who would benefit as a result of you being able to do this? How long are you going to go without getting what you really want? How would your life be different if you had the knowledge, skills, and mindset of a real Ninja? What would you do with your new-found skills? How would it feel to be able to teach this art to change the lives of others? My story began in 1980 - when I could count on 1 hand exactly how many teachers existed in the Western-world! And to get to them, I had no choice but to spend hundreds, sometimes thousands of dollars to travel to train with them. So, I really get it when a student contacts me and tells me how badly they want to train in this art but can't because of the lack of a dojo near them, finances, and a hundred other reasons. I've taken all this and created one of the most complete training programs for learning ninja training online, so that you can truly learn ninjutsu, and get your ninja training online - right here - and train right where you are - no matter where in the world you live! And, I've done it by recording all of the step-by-step techniques in my in-house program on video. All 5 modules that will take you from White to Black Belt - and beyond. So you can learn the exact same lessons, techniques, and skills that students have been learning with me for the past 21 years! Now, you can confidently enroll in a complete Online Ninja Training Program and become a certified Black Belt in the martial art of Ninjutsu. And, if you want to go further, you can even become a fully licensed instructor and official Dojo or Group Leader, teaching my official, WCI Ninja Training Program in your own hometown. Imagine... you can go from having no access to a Ninja teacher where you live, to being THE Master Instructor for others looking for the power of this art! Students who already hold rank and training experience in Bujinkan Ninjutsu and want to improve their knowledge and go on to earn their Black Belt. Individuals new to the art who do not have any previous knowledge or training in Ninjutsu and want to begin. 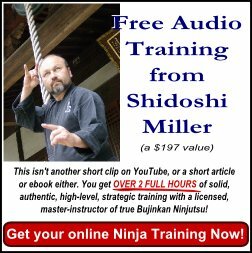 This is the perfect program for anyone who does not have an authentic Ninjutsu Dojo (school) near where they live and really wants to train in Ninjutsu anyway. This program was designed for everyone interested in mastering the art of Ninjutsu - regardless of whether you're 14 or 74! How does the Warrior Concepts' Online Ninja Training Program Work? 5) Articles, books, and other training resources written and produced by me especially for my personal and "Inner Circle" students. The Black Belt Training Program, which will take you from white belt to Shodan ('1st degree Black Belt), consists of 5 Modules. Each module focuses on a particular self defense strategy, emotional response, and set of tactics taken directly from the authentic lessons of Bujinkan Ninpo-Taijutsu. There are also additional sub-sets of training that you can do that involve adding weapons and other topics, subjects, and skills - allowing you to tailor the training to your wants and needs. Teaching Core. This consists of a series of short, technique-based video clips in which the Ninpo-Taijutsu techniques and skills are demonstrated for you. These videos are separated and organized based on the kyu (or Dan) level you are working on. In addition to the basic demonstration of the skill, each technique is explained by me and, where necessary, additional clips are produced to help you get through techniques or skills that you are having unique challenges with. You will receive detailed explanations about how to perform the techniques correctly - and what common mistakes to avoid. Each kyu (pre-black belt level) module is divided into 3 rank levels - each with its own academic and historical studies and proficiency requirements. Coaching Core. This part of the program provides the necessary "feedback" that you need from your teacher. This can be email-based, or you can choose the "live coaching" option and get access to my weekly coaching calls with other students just like you from around the world. Either way, this aspect of the WCI Online Ninja Training Program allows you to ask questions about your training, the techniques and skills, or anything else that you need help with. The point is that I am here to help you to progress in your training toward Mastery! Accountability/Feedback Core. This is the part that most solo students who are trying to learn the art of Ninjutsu are missing! This can include everything from video reviews to actual video testing on the material to receive rank grading. Ranking is awarded directly from Soke Hatsumi - the current-generation's headmaster of the 9 schools which make up the Bujinkan Dojo, and through me as your teacher on the Path. The program offers the possibility to train and progress all the way to Shodan (1st degree Black belt). You have the option of just training, or actually testing and being awarded rank at each level. The time period between ranks is typically between 2 and 4 months - depending on your personal understanding and progress. That means that it will take you anywhere from 2 1/2 to 4 years to receive your Shodan. Of course, this can be accelerated by your attendance at additional live training events and the years Ninja Training Camps where you can get additional help and feedback. But these are not mandatory for training and progress. The only test that cannot be done via video testing is that for your Black Belt. This is an approximately 1 to 2 hour test, and must be done in-person. 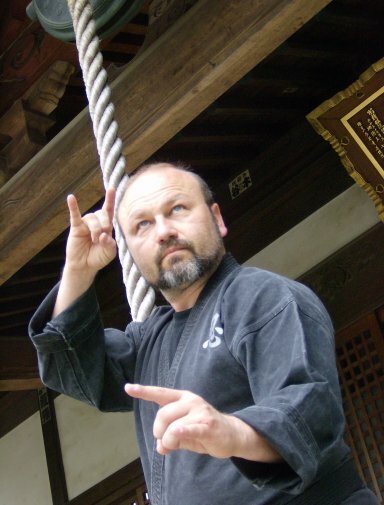 This special study program is designed for students who have attained the rank of at least Shodan and who want to continue their Ninjutsu studies toward becoming a fully-licensed Shidoshi. To enroll in this program, you must apply directly with me so that I can explain what is required. This program fills in a necessary yet missing element within Ninjutsu training today - and that is "How to be an effective teacher and group leader! And this program not only teaches you the difference, but also arms you with the tools, knowledge, and ability to be the best teacher that you can - for yourself and, more importantly... for your students! A dojo / group leader is licensed and permitted to test his or her own ninjutsu students up to one degree beneath his or her own rank (no higher than 4th dan). Training in the Dojo/Shibu-cho program is through online and telephone coaching only. Price is based on the type of coaching, subjects, and time involved. Contact me right now to find out how you can begin training in one of these programs right away. Don't wait because I can only take 10 students per class at any given time. So, send me an email at jmmiller@warrior-concepts-online.com to schedule a free, no-obligation training strategy call where we will create a plan for your training and progress for the next 3 to 6 months! During this call, you will also get all the information you need to make a decision about training in one or all of these powerful programs! When you send your email to jmmiller@warrior-concepts-online.com, put the words "Call Request" in the subject line. Also include: several "best times" that fit your schedule so that I can match them up with my own schedule. I will then respond with the date/time of your complimentary training/strategy session. To Your Achievement Of Warrior Mastery!